The exhumation began before dawn, under the cover of huge sheets of blue tarpaulin draped over Arafat's mausoleum in his former government compound in the West Bank city of Ramallah. RAMALLAH, West Bank — Palestinian authorities on Tuesday opened Yasser Arafat’s grave and foreign experts took samples from his remains as part of a long-shot attempt – eight years after the iconic leader’s mysterious death – to determine whether he was poisoned, as relatives and some political successors have claimed. The exhumation began before dawn, under the cover of huge sheets of blue tarpaulin draped over Arafat’s mausoleum in his former government compound in the West Bank city of Ramallah. By mid-morning, the grave was reclosed, said Tawfik Tirawi, a former Palestinian intelligence chief who heads the investigation into Arafat’s death. Arafat died in November 2004 at a French military hospital, a month after suddenly falling ill at his Ramallah compound, which was at the time besieged by Israeli troops. The immediate cause of death was a stroke, but the underlying reasons were unclear, leading to widespread belief in the Arab world that Israel poisoned the 75-year-old symbol of Palestinian nationalism. 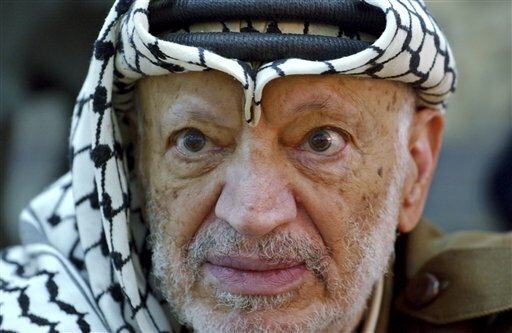 Israel has denied involvement in Arafat’s death. An investigation was launched at the time, but it then lay dormant for years, only to be revived this summer when a Swiss lab detected elevated traces of a lethal radioactive substance, polonium-210, in biological stains on his clothing. The lab said the tests were inconclusive and that it needed to examine the remains for a clearer picture. Arafat’s successor, Mahmoud Abbas, authorized the exhumation despite strong cultural and religious taboos against disturbing a gravesite, apparently to avoid any suggestion that the current leadership was standing in the way of a thorough investigation. Since mid-November, workers have been drilling through thick layers of concrete encasing the tomb. The grave was opened before dawn Tuesday, according to a Palestinian official who spoke on condition of anonymity because he was not authorized to discuss the details of the exhumation with the media. The official said some of the remains were moved to a nearby mosque, but that the team then encountered technical difficulties. He would not elaborate. The experts decided to return the remains to the grave and take the samples without moving what was left of the body, the official said. The exhumation was attended by experts from Switzerland, France and Russia who will examine the samples in their home countries, the official said. Earlier, samples were also taken from Arafat’s bedroom, office and personal belongings, he said. Nidaa Younes, a Palestinian government employee, said it was unnecessary to dig up the remains. “Our religion forbids exhuming graves. It is not nice at all to do this, even if religion permits it in some cases,” she said, adding that she believes Israel was responsible for Arafat’s death. Suspicions about Arafat’s death flared again over the summer, when the Arab satellite TV channel Al-Jazeera took some of Arafat’s belongings, provided by his widow Suha, to a Swiss lab for testing. The belongings being tested included what Mrs. Arafat said were her husband’s fur hat and a woolen cap with some of his hair, a toothbrush, and clothing with his urine and blood stains. The Institute of Radiation Physics discovered elevated traces of polonium-210, the same substance that killed Alexander Litvinenko, a former KGB officer turned Kremlin critic, in 2006. Mrs. Arafat urged the Palestinian Authority, the West Bank-based self-rule government headed by Abbas, to exhume her husband’s remains and also asked the French government to launch a separate investigation. Eventually, Abbas also requested that Russia join the probe. For decades, Arafat was the symbol of the Palestinians’ struggle for an independent state. Since returning to the Palestinian territories in the early 1990s, as part of interim peace deals with Israel, he zigzagged between leading negotiations with Israel and condoning violence as a means of obtaining political goals. Arafat, along with two Israeli leaders, received the Nobel Peace Prize in 1994 for his commitment to work toward peace with Israel. He later presided over the Palestinians as they waged a violent uprising against Israel’s occupation of the West Bank, Gaza and east Jerusalem, the territories they seek for an independent state. Israel accused him of ordering attacks against Israelis, and confined him to his Ramallah compound. He stayed there for more than two years before falling ill. In his later years, Arafat also faced criticism at home, with some accusing his political circle of corruption and the pocketing of large amounts of aid. But he remains a widely revered figure in the Palestinian territories, and his portrait frequently appears in government offices and street posters.